After a fairly uneventful flight into the “world’s most dangerous airport”, I finally took my first steps on the trail towards EBC. Due to flight delays, it wasn’t until 3 pm when I began trekking to Phakding (2,610 m), which is a very late start (usually I would finish trekking for the day by that time). Clouds had rolled in again, and there was some light rain. After a couple hours I made it to Phakding, and had some dal bhat for dinner. Turns out my stomach didn’t enjoy the dal bhat I had for dinner, so I ended up spending all night and the next day unable to do anything but move between the bathroom and my bed. Luckily, this is the only time I got sick during my four months of travel. Feeling a bit better, I decided to take it easy and do a short hike to Monjo (2 hours, 2,835 m). Even this short day was quite difficult, and I drank a ton of fluids trying to get myself back into proper condition. In Monjo, I met a Amy and Cody, a british/american couple who I would run into a few times later on in the trek. The next day, I was ready to make the climb up to Namche Bazaar (3,440 m). Namche Bazaar is the largest town in the region and is known as the “sherpa capital”. I found myself moving quite slow up the final hill into town, but I did have a fairly heavy pack, and was still recovering from the food poisoning. The last slog up into Namche is the first real big uphill section of the trek, and I was exhausted by the end of it! I got a room at a teahouse in the mid afternoon, slept until dinner, and then went right back to bed after dinner. During dinner, I ended up talking to a group of middle aged women from Ottawa! Small world. Time for a rest day. To avoid getting acute mountain sickness (AMS), you need to ascend slowly until your body has acclimatized. The general rule of thumb is you should sleep a maximum of 300-400 meters higher than your previous night, and every 1000 meters you should take a rest day. However, on a “rest” day, it is best to do an acclimatization hike up to a higher elevation, and then go back down to sleep. On this day, I did a hike up to the Everest View Hotel and Khumjung village, close to 3900 meters. Hiking on rest days was a lot easier for me, as I didn’t need to carry my heavy pack. After my rest day, it was time to hike to Tengboche (3,867 m). This hike starts out fairly flat with beautiful views of Ama Dablam (6,812 m). After an hour or so, you descend a few hundred meters deep into a valley to cross a river, before having to climb back up another 550 meters. It was in Tengboche that I learned of Ueli Steck’s death on Nuptse (7,861 m), and that he was to be cremated at the Tengboche Monastery the next day. From Tengboche I did a short 1.5 hour hike to Pangboche (3,985 m). 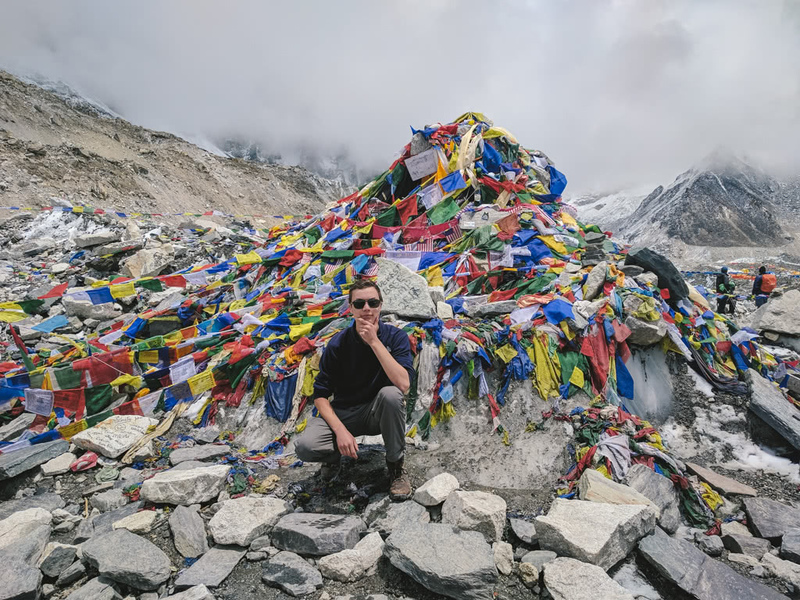 After eating an early lunch in Pangboche, I decided I would spend the rest of the day going up to Ama Dablam’s Base Camp (4,570 m) for acclimatization. Because it was so late in the day, the weather started going downhill pretty fast, and by the halfway point it was snowing a bit. I pushed on, and made it after a few hours. After spending about an hour at base camp, I headed back down to Pangboche to sleep. My next stop after Pangboche was Dingboche (4,410 m). 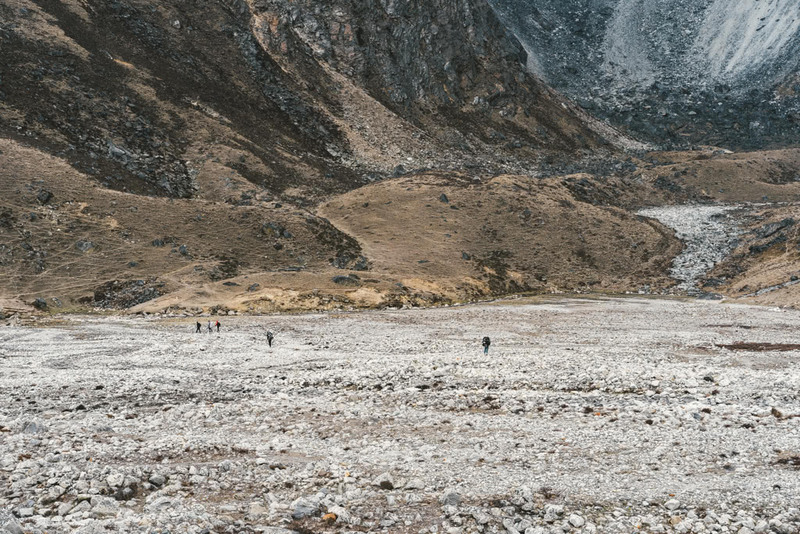 While there is a 400 meter gain from Pangboche, the grade is fairly gradual so this hike wasn’t very difficult. I was feeling very good with the altitude, and took a 15 minute hike up a hill behind the town to watch the sunset. 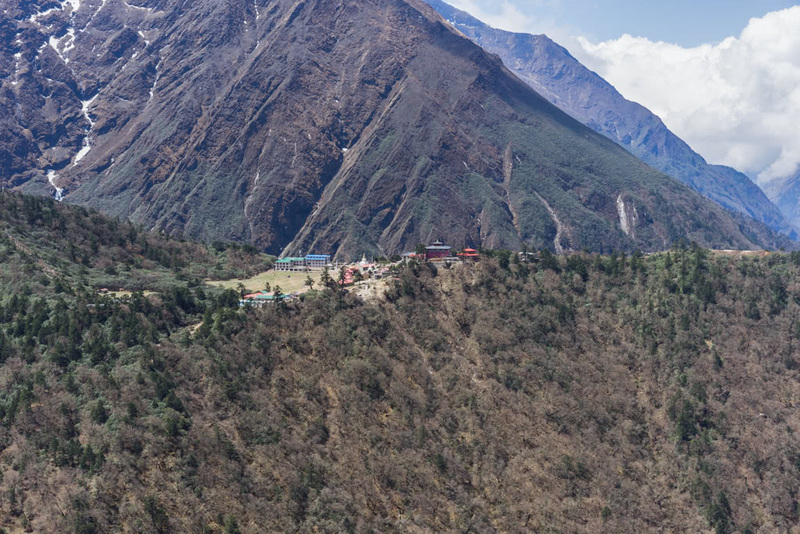 The next day, I diverged from the busy EBC route to hike to Chukhung Village (4,730 m) in the Chukhung Valley. When I arrived in Chukhung, I decided to see how far I could get up Chukhung Ri (5,546 m). I got to around 5,200 meters before deciding to turn back, as high winds were almost blowing me off the mountain. Time for a pass! Today I was to cross Kongma La (5,528 m), and descend into Lobuche (4,940 m). Crossing this pass was the toughest day of the whole trek for me. I woke up at 4:30am, had breakfast and set off. The weather was cloudy and I could hear thunder in the distance. The 800 meter ascent to the top of the pass was difficult, and felt endless. About 15 minutes before reaching the top, it started snowing heavily. At this point, I had caught up with a few others who had started a bit earlier than me – this was a good as we were able to keep an eye on each other during our descent in whiteout conditions. The path down from the top of the pass was completly hidden by an inch or two of snow, but there was only one way down so we slowly descended on our own path. When I got to the bottom of the pass my water had frozen, so I was really hoping that Lobuche would be right infront of me. In reality, there was still the Khumbu Glacier that needed to be crossed. There was a ~50 meter steep climb to get onto the glacier, and then about an hour of walking on thin ridges between glacial ponds before finally arriving in Lobuche. In Lobuche, I met the group of solo-trekkers that I would spend the rest of the trek with (two of them had been with me during the descent from the pass). Almost at EBC! The hike from Lobuche to Gorak Shep (5,164 m) isn’t too difficult, but the altitude makes everyone walk fairly slow. The morning weather on this day wasn’t great – it was foggy with a fresh blanket of snow on the ground. I arrived at Gorak Shep in time for lunch before heading to Everest Base Camp for the afternoon. From Gorak Shep, EBC (5,380 m) is only a few hours away. There are no tea houses at base camp, so I just went to visit for a few hours in the afternoon. I was in Nepal in May, which is the time of year when almost all Everest summits take place, so base camp was a very busy place! Me at Everest Base Camp! You may have noticed that there hasn’t really been any photos of Mount Everst itself so far. On the Nepal side, Everest is mostly hidden – other than it’s summit, which peeks up behind the Lhotse wall. Kala Patthar is a viewpoint a few hundred meters above Gorak Shep, and offers spectacular views of the surrounding mountains, including Everest. I woke up at around 4:30am the day after visiting EBC to climb it for sunrise. After an early morning climb of Kala Patthar, myself and a few others decided to start the trek back to Kathmandu. We ate brunch, and started our descent. We ended up getting to Periche (4,371 m) before deciding to call it a day, 1200 meters lower than the top of Kala Patthar. The next day we decided to make it back to Namche Bazaar for a well deserved drink in the world’s highest Irish Pub. This was a decently long hike, we stopped for lunch in Phortse (3,840 m), and then made it to Namche by mid afternoon. I am also planning a 4-month trip in Asia and trekking in Nepal is on my list! You’ll love Nepal, I can’t wait to go back again. Where else are you planning on visiting?